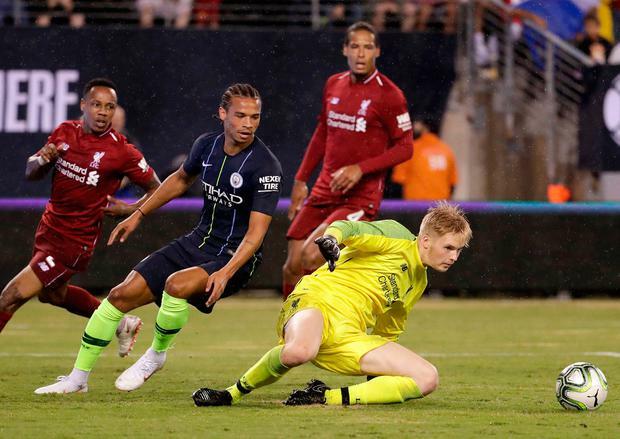 19-year-old Irish goalkeeper Caoimhin Kelleher has been praised for his performance for Liverpool against Manchester City in the International Champions Cup. Sadio Mane's stoppage-time penalty sealed a 2-1 comeback win for Liverpool over the Premier League champions with fellow Irish teen Tyreke Wilson making the bench for City. Former Ringmahon Rangers net-minder Kelleher played the whole second half and made some crucial save for Jurgen Klopp's men. With record signing Alisson the obvious first-choice for Kllopp, the departure of Danny Ward to Leicester and doubts around the futures of Loris Karius and Simon Mignolet, Kelleher could be vying for a squad place with last year's Champions League finalists. Have to say Caoimhin Kelleher didnt put a foot wrong either. Nice save with feet from Liverpool's 19yo Irish goalkeeper Caoimhin Kelleher. Fabinho outpaced by Bernardo who found Sane in the box. After a goalless first half to the match in New York, the game came to life in the second with Leroy Sane breaking the deadlock to put City ahead after 57 minutes. Their lead did not last long, however, as Mohamed Salah buried a header six minutes later - with his second touch of the game and just 52 seconds after coming off the bench. The Egyptian came close to scoring another two in the closing minutes - a header was blocked on the line and his second effort struck the crossbar. But the period of concerted pressure from the Reds finally paid off in injury time. Awarded a penalty when Dominic Solanke was fouled in the back by Tosin Adarabioyo, Liverpool forward Mane rolled his spot-kick to the left as Joe Hart dived in the opposite direction, providing a dramatic close to the match between the Premier League rivals.